Yard sale season is in full swing. You may be aware that yard sales are an excellent way to get bargains, but did you know that they are also a great avenue for teaching your child valuable life lessons? My father, being a yard sale fanatic, had me tag along with him every Saturday morning. That time together holds some of my fondest childhood memories with him: hunting for bargains. He would look for tools and electronics while I would look for toys. He may not have known it at the time, but I learned so many lessons from those experiences that have shaped my habits as an adult today. According to Infographic Journal, there are an average of 165,000 yard sales held each week in the United States. That gives you plenty of opportunities to spend quality time with your child. 83 percent of people take their children with them when going to yard sales, and 94 percent buy items for their kids during these trips. Make these trips a routine with your kids and take the opportunity to talk to them about school, their friends, and what’s going on in their lives. In addition to spending quality time together, there are many lessons you can teach your child at yard sales. Teach about budgeting and saving money. Give your child a budget to spend at the yard sales and help him or her stay under it. With 42 percent of sellers expecting to come down on prices, encourage your child to negotiate to further save money. You can pull up the retail price of the same item online and compare it to the yard sale price to teach your child about savings. With the average price of a yard sale item being around $0.85, it’s sure to be a shocking price difference! Guide critical thinking skills and prioritizing. When deciding what to buy at yard sales, guide your child to think about value. What items are worth buying used and at a bargain versus brand new (clothes, toys, electronics, etc.)? Help your child carefully inspect items to determine if they are good quality and safe. Guide your child to think through his or her decisions. Promote being green and less wasteful. Buying used products from yard sales is an excellent way to help the planet. Through this process, teach your child to simplify and be less wasteful. Most items that are not sold at garage sales are usually donated to local charities. Teach your child about helping someone in need by donating. Suggest that your child donate any money saved during these trips to a worthy cause. The experience might also inspire your child to donate his or her infrequently used toys or clothes to charity. As a parent, there are constantly opportunities for you to teach lessons. It just takes some planning on your end to turn a fun shopping trip at a yard sale into a valuable moment in your child’s development. For more opportunities to teach life lessons, check out our YOU: Your Child's First Teacher books, now available on Amazon. On a rainy Saturday afternoon at my sister’s house, our sons, who had just turned two, were playing with their new birthday toys. Everything was going well until one of them saw the other having the time of his life with a particular toy. You know where this is going. My son, Seth, was jumping off a large plastic car (don’t worry, the rug beneath the car kept it in place) when Daniel decided he wanted to jump off of it, too. Seth ran back around, pushed Daniel to the side, and climbed on the car to jump. As you can imagine, this left Daniel sad and crying. Seth stood near the car with a concerned look on his face. He seemed curious as to why Daniel was crying, but he wasn’t making the connection that it was a result of his actions. Seth gave Daniel a hug, which Daniel accepted, and then attempted to get on the car again. I realized this was a great teachable moment to show the boys how to share nicely, so I used these four tactics to help. Successfully teaching a child to share involves many stages. It’s not something learned quickly, especially for a two year old. While you can teach a toddler to share at this age, he or she likely won’t fully understand the concept or value of sharing for a few more years. You may need to show and tell your child repeatedly how to share, which can take time to learn and change their behavior, so remember to be patient when teaching. As stated in the first book of YOU: Your Child’s First Teacher, “Children learn to control their behavior by imitating the behavior of adults around them. They will learn more from what they see you do than they ever will from what you say.” Take the opportunity to demonstrate how you share with your partner, grandma, or a neighbor. It may not seem like much, but your child is observing and learning how to behave, which can make a big impact. When encouraging Seth and Daniel to take turns, I always told them whose turn it was and cheered the other on when he completed the jump. This strategy worked out well because although they were antsy waiting for their turns, they knew to wait until the other was done based on the name I was announcing. It kept them more calm and orderly. Are the boys excellent sharers now? No, about an hour later they were bickering over a new toy, but jumping in and guiding the situation helped a lot. We took the first step in learning how and why to share, and they were both more willing to because of our earlier experience. How do you encourage sharing with your children? Tell me your story in the comments below. Do you want more lessons that develop your child's social and emotional well-being? Check out our YOU: Your Child's First Teacher books, now available on Amazon. It's (unofficially) barbecue season, when evening walks around the neighborhood are highlighted by smoky smells wafting from grills. Most people love good barbecue, and I’m sure your family has a few treasured recipes that you cook throughout the summer. This weekend and throughout the summer, expand your repertoire to include healthy grilling recipes that will have the kids begging for seconds. Skewers are a great way to grill your protein and vegetables at the same time, making for a quick and easy well-rounded meal. These marinated Greek chicken skewers feature lean chicken protein and multi-colored vegetables from red and green peppers and red onion. Instead of eating the fried food on a stick at fairs and festivals, try a few of these 38 healthy foods on a stick that may or may not require grilling, but still represent a slice (or stick) of summer. Salmon on the grill is one of the best ways to enjoy this rich and flavorful fish, which is full of heart-healthy Omega-3 fatty acids. Plus, it keeps your kitchen from stinking for days. Try this honey soy grilled salmon with edamame for a satisfying dinner. If your kids prefer shrimp to salmon, there are a myriad of grilled shrimp recipes available. As long as you avoid sugary marinades, shrimp are healthy and easy to grill quickly. Turkey, salmon, and even portobello burgers are all protein-rich and leaner alternatives to beef burgers. The next time the kids ask for burgers, try this California turkey burger recipe or this grilled portobello mushroom burger and see if they prefer it to hamburgers. Did you know that most store-bought (and even homemade) barbecue sauces have lots of hidden sugar? From molasses to brown sugar, the added sweeteners can dose your kids with a sugar high (and subsequent crash). Play around with your own homemade barbecue sauce, using as little added sugar as possible. This recipe from Whole Foods only uses chopped dates for the sweetened effect, which is a fiber-rich alternative to other sugar forms. Grilled corn is so delicious. If you’re in the Midwest where there is sweet corn a-plenty, your family won’t even need to add butter—the fresh sweet corn flavors develop nicely when heated on the grill. The kids will love the slight charred look and sweet taste. What are your family’s favorite healthy grilling recipes? Share them with us in the comments below. For a complete guide to raising healthy, well-developed kids, check out our YOU: Your Child's First Teacher books, now available on Amazon. We get a lot of questions from parents about our YOU Program approach. In this holistic approach to parenting, there are four areas for parents to address with their child: physical health, emotional well-being, social well-being, and academic success. Our YOU Program promotes helping a child in all four areas in a balanced manner. Parents tend to be great in one or two areas, but may not know how to help in the others. It's important that all four areas contribute to academic success as a child and eventually success as an adult. In the end, parents want their children to achieve more than they have. 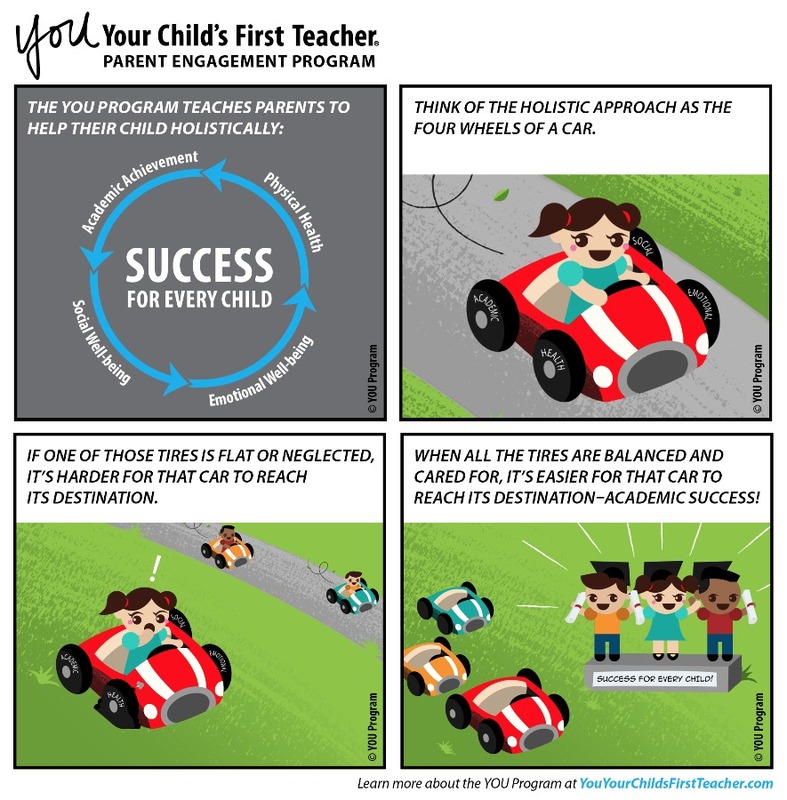 By implementing this approach you can be sure you are helping your child accomplish more! Learn more about this holistic approach to parenting in our YOU: Your Child's First Teacher books, now available on Amazon.